Non-elastic crankshaft with flame hardened journals. 420 stainless steel, nickel coated manifold, special aluminum alloy connecting rods, cast aluminum symmetrical crankcase. Solid ceramic plunger, lubricated high and low pressure seal system. Available with external gear reducer for direct drive applications. Use NG for units without gearbox. Triplex plunger pump, available in 4 versions. Patent pending, symmetrical power end design featuring top and bottom mounting holes allowing for easy left to right shaft conversion. Low-high pressure packing design with integrated cooling system. high volumetric efficiency suction/delivery valves featuring new spherical design of sealing areas. Splash lubrication. 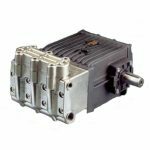 External gearbox available in 3 ratios and positionable on left or right side of the pump. Flushing systems available on request on selected versions. Pratissoli KS Series Plunger Pumps Torque Specs.